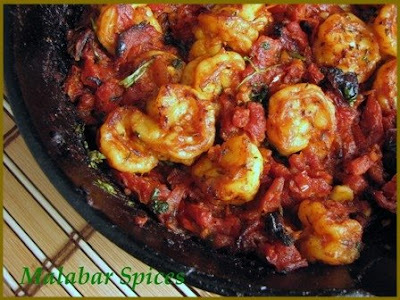 Malabar Spices...: Garlicky Shrimp With Sun-Dried Tomatoes..
Garlicky Shrimp With Sun-Dried Tomatoes.. This is one of those recipes that looked so luscious in the photo that it just begged to be tried out! !It was published in the New York Times Dining Section a couple of months back by Mark Bittman. As I started cooking it,I was skeptical..how can the shrimps have any spice without some chili flakes...somehow shrimps have to be spiced up really well for me to enjoy it. Don't get me wrong, I enjoy sushi too but shrimps..any day I will opt for the tiny Malabar shrimps over the giant tiger prawns here!! So without remorse, I added some red pepper flakes, omitted the capers and doubled the quantity of garlic. Also I added a handful of shallots (not onions, definitely) chopped up finely. Here is the original recipe for those who want to try it as it is. The recipe calls for sun dried tomatoes which add a smoky and extremely tart taste to it yet keeps the shrimps crunchy unlike real tomatoes which would make the recipe watery with all the pulp.I used plain dried sun dried tomaotes from the farmer's market. If you are using sun dried tomatoes packed in olive oil you can use the oil from that and reduce plain olive oil. That would add a lot of flavor too. So now this is my version of this succulent recipe. My photo doesn't look as light as the original one as I let it broil for 2 more minutes to get the brown crust. 1. Preheat broiler; rack should be 2 to 4 inches from heat source and the heat as high as possible. 2. Put oil in a large, ovenproof cast-iron skillet over medium heat and add the red pepper flakes, garlic and tomatoes . Cook just until mixture sizzles, then add stock or wine (Substitute with 1/4 cup white vinegar) raise heat and bring to a boil. Cook for about 3 minutes, then add shrimp, turning them in sauce. Add salt and stir well. 3. Put skillet under broiler and cook until shrimp are done, 5 to 7 minutes, turning once. Sprinkle with chopped parsley/cilantro and pepper, garnish with basil, and serve hot or warm. You could even add a dash of lemon juice if the tartness is not enough. This goes really well with a bowl of pasta, spaghetti with sauce or fried rice!! Sooperraa iruku !! Looks mouth-watering- definitely smaller variety is better tasting than the bigger ones..
Mallu, very lovely fusion dish. Soury and garlicky, yum, I wish I had a tablespoon right now. It's almost 1am and I just got up from bed deciding I wasn't that sleepy after all. Came to check on my favorite Mallugirl and BOING! A mouthwatering photograph! I'll try this after my exams! P.S. Where did you get the sun dried tomatoes from? Looks delicious Shaheen. I am with you on the chili flakes, my nose has to water ;) while eating sea food. Tomatoes, vinegar and lemon juice??? The picture looks very tempting! Rachel, sundried tomatoes and shrimp.. first time for me too but now i am emboldened to use them more often. they have a nice tang. zlamushka..u hit it on the nail..garlicky but not too sour. mac,the tomatoes are from the farmer's market..hey did u start getting curry leaves? the price has dropped back to normal here. sra.. i was thinking of that when i posted it.. what will the desis do for sundried tomaotes. but then u have such wonderful tomatoes and sunshine there, ur tomatoes will be any day better! !let me know if u get around to drying them. jyo, no lemon juice and vinegar is instead of white wine if u want to substitute. so the tang is only from the tomatoes. it doesn't end up sour.tastes like rasam family. 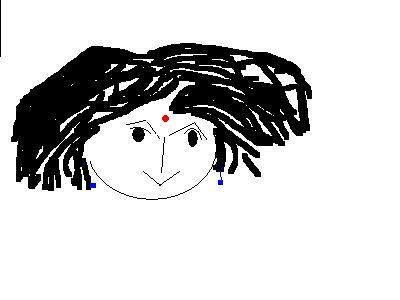 sandeepa, hmm. now thats something i haven't tried.. turmeric and salt.. on seocnd thots... no,.. i need more spice. Shaheen, this looks fantastic and I cannot wait to try it out. With yours and Indo's I have two great shrimp recipes! Wonderful recipes Mallu girl.Thiugh I am a chettiar I am also born and brought up in kerala.Only after marriage came to Tamilnadu(ie 25 years).So I am always crazy of kerala food. wonderful recipes. Great recipe!!! I've always liked your blog... Please add me to your "From the Mainland" list... Hope i do make it thr. Gosh, awesome dish!! I loved that picture. Thanks for sharing the recipe. Hope to try out all your dishes one by one..As usual very yummy pic!! Looks mouthwatering. good pics too..
Yessir! :D We've started getting the curry leaves. But I think they're from local growers.